The Inateck BP2001 isn’t the greatest speaker in the world, but it is more than worth the asking price of $30. For $30, this is a great deal, as long as you keep your expectations in line. Similarly to Anker, who makes one of our favorite speakers for under $50, Inateck is a company known for making a little bit of everything. Like Anker, they’re also known for being pretty good at it. The company makes a few Bluetooth speakers, and the Inateck BP2001 is one of their more popular models, probably due to its price. While the BP2001 lists for around $60, it can usually be found going for $30 online. We’re usually a little wary of speakers priced this low, but we’ve been pleasantly surprised before, so we were willing to risk it. Open up the box and the first thing you’ll find is the speaker. Underneath you’ll find a plastic bag containing the USB cable and 3.5 mm audio cable, and the manual. As far as we can tell, the Inateck BP2001 is only available in one color: black. Luckily, this suits the speaker’s look quite well. This isn’t the sleekest-looking speaker we’ve ever laid eyes on, but (and this isn’t the first time we’re going to use this qualifier) considering the price, it’s fairly nice looking. The BP2001 is constructed out of environment-friendly ABS plastic which lends it a sturdy feel while remaining light. We didn’t want to drop it for the purposes of testing, but it feels like it would survive a drop on a carpeted floor or in the grass just fine. On concrete, you might be in trouble. The speaker has rubber feet on the bottom to keep it from moving, and this is especially handy here as the Inateck BP2001 doubles as a stand for an iPad. A kickstand on the back of the speaker prevents the tablet from toppling over. There is no connectivity for a tablet, so the stand isn’t limited to iPads only, but any tablet with a similar form factor should work just as well. There is no NFC here, but pairing is simple. Flip the power switch on the back of the speaker and it turns on and enters pairing mode. Then simply pair from the Bluetooth settings on your device. A 3.5 mm jack is also available to connect devices that aren’t equipped with Bluetooth. Range is the standard 33 feet and I had no issues with dropouts or stuttering as long as I stayed within range. Looking at the controls, well, there isn’t much to see. Aside from the power button on the back, the large button on the front is the only onboard control option. Tapping the speaker will pause and resume playback or answer and end calls, while holding it with connect or disconnect Bluetooth and / or enter pairing mode. We were a bit surprised to see speakerphone included given the price, but calls worked well. The Inateck BP2001 is equipped with an 800 mAh battery which is claimed as providing up to 5 – 6 hours of playback. In our testing we got between 5.5 and 6 hours on two separate occasions, so this definitely seems to be an accurate estimate. On the other hand, charge time is quoted as 3 to 4 hours with a 5V/1A power adapter, which seems like a long time given the battery size. Using our go-to generic charger, charge time from completely dead to 100% was around 3 hours. Before we tackle sound quality, you’ve got to keep in mind that when we’re dealing with a price tag this low, our expectations are considerably lower than a speaker that sells for $300 or more. That said, awful sounding speakers don’t get a free pass because they don’t cost much. Looking at the lows, there really isn’t all that much here. Given how thin the speaker is, that is completely understandable. Actually, given the size, I can’t say that the bass is impressive, but there is certainly more here than I expected. The low mids carry bass guitar, and lower guitar frequencies fairly well. Moving into the higher mids, things can be a bit harsh at times, especially as you push the volume higher. This same emphasis in the mids does make the speaker very well suited to the spoken word, however. There was a surprising amount of detail on hi-hats and cymbals, but on rock music especially, highs can be somewhat “fizzy” sounding. On jazz or other more subdued music, this wasn’t an issue. Volume is impressive considering the size. As you approach maximum volume, the sound does get considerably more harsh – especially with certain types of music – but this is still a powerful little speaker. Everything considered, we were happy with the price to performance ratio when it came to sound. No, this isn’t the greatest speaker we’ve ever encountered – nobody, including us, was expecting it to be. It sounds about as good as something this small can, and that means that while it isn’t the best solution for music, it works perfectly for podcasts, audiobooks, and movies. 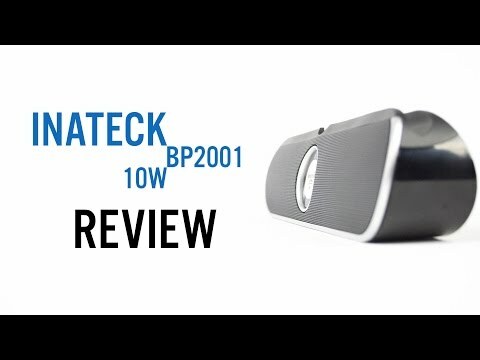 At $30, the Inateck BP2001 is a great option if you’re looking for an inexpensive speaker to carry around with you, or even to use as a backup for your main speaker. We’re looking forward to seeing more from Inateck.